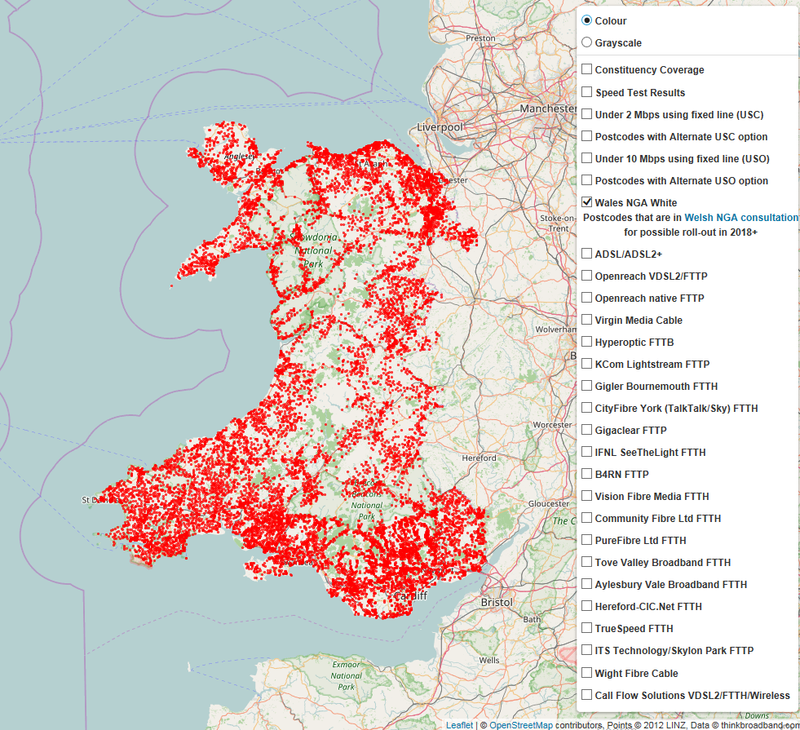 There are a few weeks left in the last Superfast Cymru broadband consultation that is seeking input on what should happen for the premises it has identified across Wales which are thought to be missing out from the existing project or commercial roll-outs. We have added the 15,763 postcodes to their own dedicated layer on our maps system letting people quickly see where work to improve which will hopefully be underway in 2018 is located. On our initial viewing of the layer we noticed there was some overlapping going on, and this is down to several factors. Wales is working to a 30 Mbps and faster definition of superfast, so our maps which currently show over 24 Mbps as superfast may also show up on the Welsh NGA White dataset. We have found a number of postcodes where the majority can get native GEA-FTTP but a handful of premises cannot. These postcodes are marked as NGA White, and the premise count from the white list should only count those that meet the criteria. Some postcodes may be split over two or more cabinet areas, and for our postcode level system we take the majority result, for statistical purposes we have found that this balances out over complete exchange areas. The NGA white postcode list should be showing the number of premises where work is still needed. Keeping large data sets like the broadband ones we track is no easy task, and with the roll-outs still underway things are changing constantly, so finding errors in any data set is not unusual, but the importance of the NGA consultations means that councils and devolved administrations should be spending a lot more time than we do on getting things right. We fairly quickly have identified some errors, e.g. SA3 3LE claims 29 premises meet the criteria for further investment when in reality they all appear to have native GEA-FTTP with speeds up to 330 Mbps available today and Gigabit options in the near future. Another postcode oddity is NP4 8LQ which we believe should be part of the NGA white list, where we estimate that VDSL2 speeds of 17 Mbps are likely and BT Wholesale show ranges from 17 to 46 Mbps for premises in the postcode, and from looking at a few other overlapping other postcodes that are in the list we'd have expected at least some premises to qualify. Also there appears to be some discrepancies in the premise counts where multiple premises appear to exist with no obvious plan but only one is in the published list. Therefore we urge people in Wales who do not have any superfast option now to double check what the consultation says for you, since correcting things once the contracts have been awarded can be a lot more complicated, especially if there are more premises than originally expected that need help. Certainly some single building 'oddities' in Cardiff that won't be covered. Companies house and Maindee barracks, Talybont student accommodation and the students union both already covered by the University network. Cardiff Football stadium car park and Lidl store. Otherwise looks like mainly new build flats that the developers should have had covered as some are still in the process of being built plus the well known blackspots by Roath Lake and Cyncoed where the long EO lines have always been an issue. 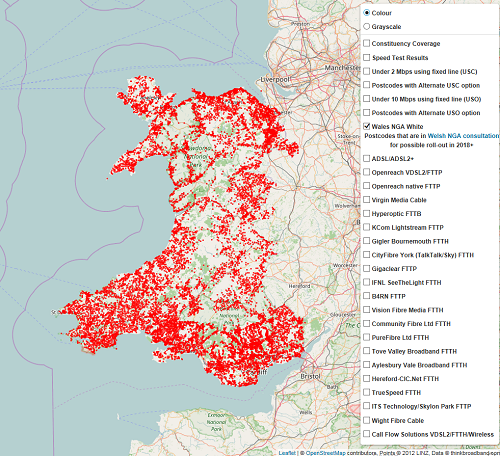 In the 'wilder' parts in Mid, North and West Wales there are a significant number of single dwelling post codes and I wonder how many of these will be covered by fixed line. 15k codes seem a lot to be covered. However there are still a large number of clusters that should be coverable by fixed line solutions. It will be interesting to see how much 4G, Radio and Satellite is (tried to be) used in the next batch. Geography often interferes with the first two and the last may not meet the 30Mb target. Andrew - TB FTTP map for Lloney Bridge - north of Knighton - shows FTTP, but the Welsh map still have these or some or most of them as non-white. Do TB black dots represent properties or are they pole mounted splitters? How are BT's checkers aligning a phone line/number with the presence of newly installed splitter? Aren't the dots just postcodes? Located at that postcode's centroid? I think you will find that the dots are Post Codes which have a dedicated GPS postions ( Lat/Long) and most times they are arranged in the direction of the postal run this can be used for giving the estermated speed from the serving FTTC. @WWWombat Yes the dots on the thinkbroadband maps are postcodes, we could repeat that for every entry on the various menus, but the assumption was people would see several mentioning it and thus apply to them all. @ValueForMoney if you look at the actual postcode search it will reveal how many premises are part of the Welsh NGA white definition, there system works by even if a postcode has 27 premises and 1 is not able to get superfast the postcode is marked as NGA White and a figure of 1 recorded against it. As for why we would plot pole mounted splitters - why? @WWWombat thank you, what logic links the post code to the phone numbers. The Post Code ought to turn all of that post code to non white. This does not appear to be happening. Postal run implies to many the route the post people take on deliveries and is nothing to do with broadband. Also postcodes don't have a dedicated lat/lng when the periodic updates come out you can find a good many that do shift, so its a data set that is challenging to work with. Andrew, indeed which is why there must be some other logic which would permit a splitter on a DP to determine whether in this case if FTTP can be ordered or not. The back dots seem too close together to be individual postcodes, hence the question. 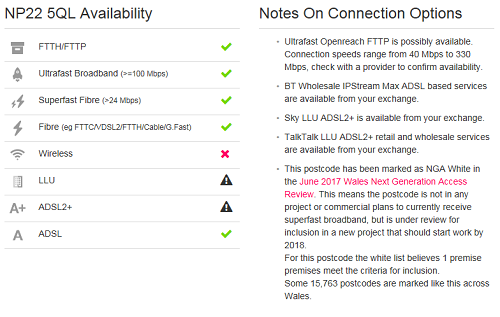 If a black dot is a post code, what is now in the post code that defines FTTP availability? I assume there must an association between a splitter and at least one telephone number. @ValueForMoney if you say which postcode then maybe someone can check for you and tell you why its on the white list, or whether they are mistakes as some appear to be. As for logic linking postcodes to telephone numbers, a pointless exercise since phone numbers can be ported around i.e. are very much a virtual entity these days, plus the complications that LLU number sets introduce. Also no one is reporting or has targets set based on coverage of % of phone lines, but much rather premises. We don't care where the splitter is, fibre runs can be a significant distance from different bits of the hardware involved. The joy of GPON. What we and the public care about is whether people can or cannot order a service. Andrew, Indeed, so on what basis is availability decided for FTTP if is not the post code? What is flagged or changed on the Broadband checker to tell a customer they can have FTTP? POst codes on their own in an Speed checker offer an ADSL service? There must be some association made with the line or related plant. Are you seriously asking, how does someone know they can order FTTP? If this knowledge is so poor amongst those who have worked for so many years in UK broadband arena they am shocked that anyone ever actually orders any broadband service. @ NGA - Openreach works on the basis of NAD (network identifiers keys). There are then matching systems which link together NAD keys with the addresses/phone numbers. @Andy - Thanks ...for the benefit of all what exactly is NAD? What is being linked between the new FTTP element and existing telephone number/ address? It can be imperfect and incomplete. IN this case BT seems to be underselling itself and its investment.